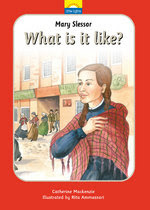 Mary Slessor was a fiery young red head who lead a tough life. From the slums of Dundee in Scotland she travelled to the wild jungles of Africa. Wherever she went she shared the good news of Jesus Christ. What was it like to work in a jute mill in Dundee or to work amongst warrior tribes in Africa? It was hard work, it was dangerous - but it was an adventure to be working for God.